Have you ever wondered just how to say something to those partners in care that don’t pull their own weight, get defensive with every comment you make, treat you like YOU are the one with the problem? Come find out Donna Strickland’s MAGIC formula for figuring out who is “Regular, Regular Under Stress, and Irregular” and how to give feedback and supervision to each. Why your Emotional Intelligence REALLY does matter. 21st century truths of intiative, achievement, orientation, emotional resiliency and flexibility. 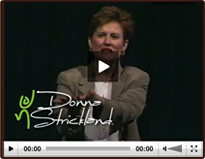 Each of Donna’s keynotes is highly customized to the needs of you and your organization.